One of the many underlying and righteous themes of Hamilton, as you no doubt know, is its emphasis on immigrants like Alexander Hamilton for the continued success of this country—and especially on women as its cornerstone. 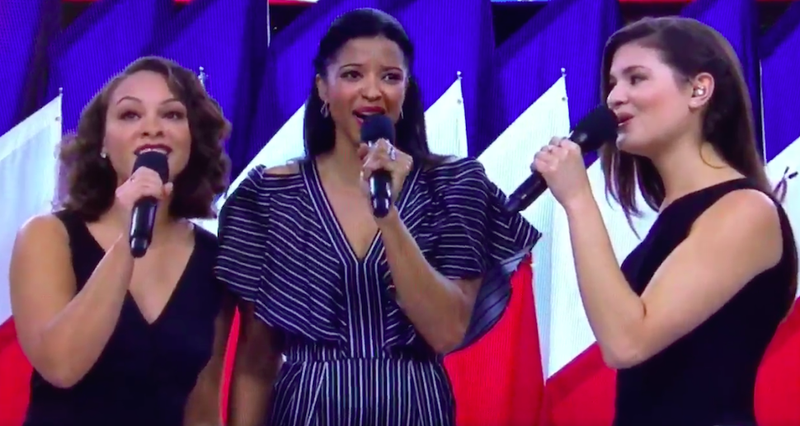 And so the show’s original Schuyler Sisters (the devastatingly talented trio Philippa Soo, Renee Elise Goldsberry and Jasmine Cephas Jones) opening Superbowl LI with “America the Beautiful” was already bound to be a powerful moment; they are three women of color, at least one of whom has immigrant family, belting with a harmonic solidness that never fails to provoke chills. But rather than singing the lyrics as written, they improvised a little line, singing “And crown thy good with brotherhood... and sisterhood! From sea to shining sea!” What an entree into a spectacle staged by one of the most patriarchal organizations in the country! Luke Bryan sang the National Anthem after that and it was off-key and underwhelming, but that’s okay because we’ll always have Hamilton.